About 450 jobs are being axed at Norwich Union in York, taking the city's job losses over the past year to more than 1,000. Aviva, which owns Norwich Union, said it planned to cut more than 4,000 jobs across the country by 2008. City of York Council said the losses were "a bitter blow" and it would do all it could to support those affected. In the past year, York has suffered job cuts by chocolate makers Terry's and Nestle and more recently British Sugar. Aviva said that half of the job losses were expected to be made through compulsory redundancies. The York centre deals with Norwich Union's marketing, strategy, IT and finance and employs 3,485 staff. Aviva said the changes were necessary as consumers changed the way they bought insurance. But workers' union Amicus described the cuts as "absolutely brutal". "They are treating their staff with contempt and clearly have more regard for their shareholder profits than their UK workforce." In addition to the Norwich Union job losses, Aviva also plans to close its York office of the BSM driving school by December 2007 with the loss of four jobs. The council's director of city strategy, Bill Woolley, said he was shocked and surprised by news of the city's cuts. "It is a bitter blow when a major employer announces such large job losses, particularly when so many are in York," he said. He said the council had spoken to regional development agency Yorkshire Forward, Business Link, The Learning and Skills Council, Job Centre Plus and York College to see how the organisations could work together to help those who have been made redundant. "We will be setting up an urgent meeting of all the relevant partners to see how we can maximise our joint efforts," he added. "However, despite this news, York's economy remains strong. 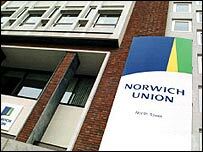 The task now is to ensure that all those who are affected by the Norwich Union announcement can benefit from its strength."